This is a practical example of an AHP group session, using AHP-OS, where you can input your judgment and see the consolidated group result of all participants. Imagine, you plan to buy a tablet computer. Decide on the importance of criteria, like display size, battery life etc. 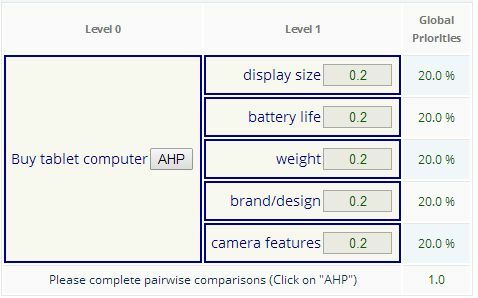 Click on the image below, input your name, click on AHP and start the pairwise comparisons. What feature is more important and how much on a scale from 1 to 9? Once finished, submit your input for group evaluation and see the results. View the detailed group results.